Welcome to the March-April Botswana conservation update. The summer has been hot, and the rain has been rare. At the end of March, the vegetation in Wild at Tuli was very dry and there was no more grass on the ground. It was terrible; we were facing a new drought. Thankfully, April brought us some good weather and much-needed rain. With 67.8mm of rain during the month, the grasses, trees and flowers have been growing and flourishing. Much to the delight of the wildlife, all of the temporary waterholes have been filled up again. 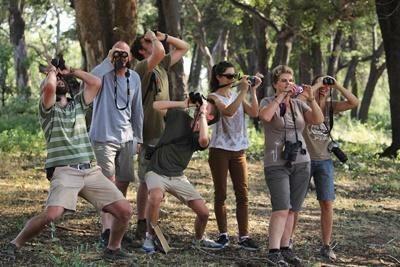 We have had several exciting wildlife sightings. Volunteers and staff have been deployed extensively for anti-poaching work in our reserve and also in the neighbouring reserves. They even found fresh tracks and snares during one of the patrols. The hard work during the erosion control activity yielded efficient results after the rains. We also rescued Mutter, a cute baby fork-tailed drongo that is being hand-raised until the time comes when he can be fully independent. As usual, we have had some fantastic wildlife sightings over the past months. Volunteers were incredibly lucky to spot a beautiful male leopard (Panthera pardus) resting on a termite mound as well as two elusive bat-eared foxes (Otocyon megalotis) running in an open area. We were also lucky enough to catch a young honey badger (Mellivora capensis) on our camera trap. This was most probably ‘Googly’, the honey badger that we rescued and released at the end of 2014. It was great news for us to see him alive and well. Our brown hyena (Parahyaena brunnea) pups, which are around 8 months old, are in incredible shape and are starting to venture out of the den more. They spend most of their time playing together and avoiding the spotted hyenas. We have also seen giraffes (Giraffa camelopardalis), common elands (Tragelaphus oryx) and impalas (Aepycers melampus). We love the bush so much; every day is a new story. 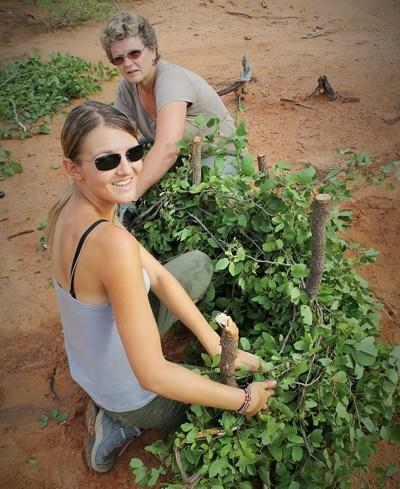 This year, in a mere three months, volunteers have removed 42 snares from the bush. Poaching and snares are the biggest threat to wildlife here. Snares in this area are set by local people, mainly to catch antelopes for their meat. They place their snares, or loops of wire, around waterholes or in highly-used game paths. The main problem with snares is they can trap any species. As well as antelopes, they can also catch leopards, hyenas, even elephants. We have seen cases of elephants with part of their trunk cut off, spotted hyenas with a missing foot or with a snare around their neck and of course, deaths. Another problem is that snares can stay harmful for a long time as poachers may not check all the snares they had set and some get left behind. Snares are dangerous until they are removed, so anti-poaching is a vital activity for our volunteers to take part in. After a year of working towards the control of soil erosion and after the summer rains, we can finally monitor the positive impact of this project. The nearly 40 dams dug by volunteers are working very well. They have slowed down the running rain water, preventing further erosion and loss of fertile soil. The dams have been filled up several times during the season and animals have enjoyed these temporary muddy waterholes. The weaving technique has been a great help for slowing down water and also retains leaves and seeds which help to create fertile areas for grasses to grow again. Lately, we have been trying a new technique to allow grasses to cover larger areas. The technique is simple: elephant dung, which is very fertile and will help grasses to grow, needs to be spread out in a designated area. Then, seeds from grasses or trees that had been collected beforehand are dispersed on top. Walking on the mixture helps to compact seeds and dung together. Finally, branches are placed on top to prevent the wind from blowing it away and birds from eating the seeds. This new technique seems very efficient as some grasses have already started to grow after only a few rains. This is a real success for the germination of grasses! For more information about erosion control techniques, please refer to the update of July and August 2014. Southern Africa is home to 21,000 of the world's remaining 28,500 rhinoceroses (Indian, Javan and Sumatran rhinoceros). In 2014, a total of 1,215 of the animals were shot dead by poachers in South Africa alone, which is one every eight hours. In comparison, in 2007 there were 13 rhinos poached in South Africa. Rhinos are killed for their horns that consist only of keratin, like our hair or our fingernails. The horn has no medical value at all. On the black market, one kilo of rhino horn goes for up to $80,000, making it more valuable than gold or heroin. The two horns of an average-sized rhino weigh almost six kilograms. The exploding demand for rhinoceros horn in the Far East, particularly in Vietnam and China, has driven up prices. Vietnam has been identified as the largest user country for rhino horn. In recent years, Vietnam's rapid economic growth has produced a broad middle class that can suddenly afford exotic animal products like ivory, bear gall bladder and tiger-bone powder. Although rhino horn has no scientific medicinal benefits, consumers believed that is a miracle drug that can be used to treat a wide range of conditions: cancer, fevers, convulsion, epilepsy, nose bleeds and even hangovers. Due to its high value, it is now also used as a status symbol by wealthy individuals. Poachers can be categorised into two groups: subsistence poachers with limited organisation and materials, and professional poachers with well-structured operations, high-technology methods and materials. Rhinos have been around for millions of years and it is heartbreaking to realise that the world’s rhinos may be extinct by 2025 if poaching continues at its current rate. We already lost the Javan rhino species (from Java and Vietnam) in 2010. 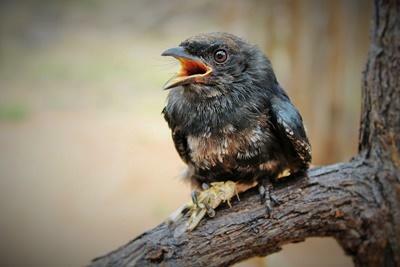 Mutters is a baby Fork-tailed Drongo (Dicurus adsimillis), which is a black bird with a deeply forked tail. On the 28th January, volunteers were digging a hole for our new hide when a tiny, weak baby bird suddenly appeared from behind the grass. We realised that he must have fallen from his nest. A rudimentary nest was quickly designed with the bottom of a plastic bottle, lined with grass to keep the rescue warm. Right from the first moment he was rescued, he was very chirpy and always seemed to have something to say and so he was aptly named ‘Mutters’. Dr Helena Fitchat, an owner of the reserve and specialist in wildlife rehabilitation, advised us on how to raise him. Parents and godparents were nominated amongst staff. A type of porridge was prepared every few hours and given to the baby bird with a pipette. Mutters grew up well and soon live worms became his favourite food. Eating insects led us to conclude that he was a Fork-tailed Drongo, known as the rogue of all birds. They mimic other birds’ alarm calls to scare them off and steal their food. They also have a reputation of being fearless and aggressive as they will mob birds of prey that enter their territory – a strategy to keep their chicks safe during the breeding season. No wonder he has got such character! His feathers still need to develop further and we are hoping that soon, he will be able to live his own life.